Hi – I’m back again, its really hard for me to write these things so I just took off the titles to individual blogs. I think WordPress is amazingly cool with titles and categorizations, but it makes it feel so formal to have titles. Seeing as I don’t really have anything to say, a title only seems to accentuate that fact. Anyway, Standard Delivery, by Veronica Nunn is now out. I’m playing piano on it, with the same group from my cd’s (Jennifer Vincent on bass and Jaz Sawyer on drums). It came off really well and is playing on radio stations across the U.S. and Canada currently. Me and Veronica played in Istanbul, Turkey about 6 months ago and I was really moved by the experience. I’m actually pretty well-read literature-wise, but history is new to me. I hated history and english in high school and it missed me that Istanbul was the old Constantinople. I figured that out the first day I was there, but I don’t think I told anybody because that’s kind of an embarrassing thing not to know. 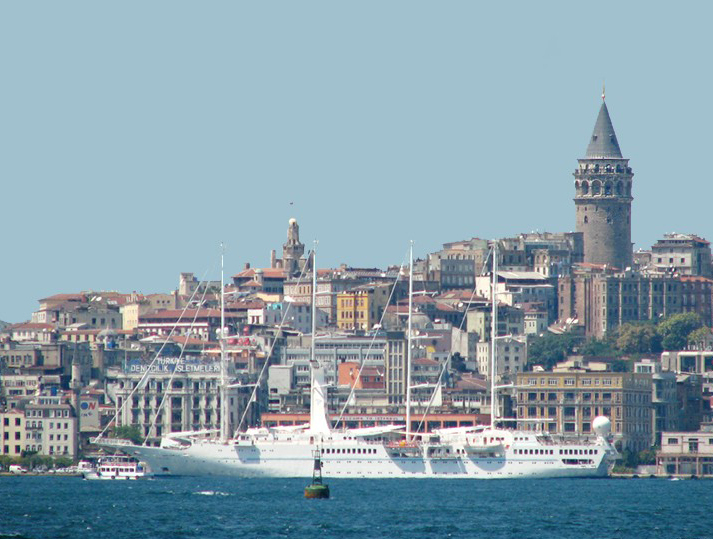 It was at a club called Nardis, located at the base of the Galata Tower (the tall, pointy thing in the picture). I’ve been to maybe 40 countries or so over the years, and so far Turkey was my favorite. It’s the people that make a country, and Istanbul had some of the nicest, most honest people I’ve met. I did visit some of the tourist spots also – like the Sophia Haga which was originally a Christian Church later changed into a Mosque. The Bizarre was kind of intense – Istanbul reminded me of New York in the shopping district, very cool, very fashionable and fun to walk around, but in the tourist district (where the Sophia Haga was) the people selling stuff were incredibly aggressive. I taxi driver told us that the local merchants often know over a hundred languages (not fluently, but just enough to sell their product), complete with local trivia about whatever country the customer is from. Anyway the whole experience was deep for me and I was really glad we went. Gotta go, I’ll write something again soon. You are currently browsing the Travis Shook's Blog weblog archives for March, 2007.